What are the most popular online bachelor's degrees offered in Washington? Washington is one of 16 member states in the Western Interstate Commission for Higher Education (WICHE). Membership comes with a host of benefits for online learners, including reduced tuition and state reciprocity agreements that allow students to pursue educational programs not offered within their home state. Additionally, students in Washington benefit from WashingtonOnline, a consortium of participating community colleges in the state that offer online courses in a variety of subjects. Here, students can complete prerequisites or an associate degree online, taking classes from several different colleges, all in one convenient space. Colleges in Washington state are following national trends prioritizing online education. According to a recent report released by the Babson Survey Research Group, a record 70.8% of academic leaders said that online learning is a crucial component of their school's long-term growth strategy. Distance learners who enroll online can study at their own pace, and many students are able to work full time as they complete their degree. Many online students prefer to take classes in their home state, which learners find advantageous for several reasons, including reduced tuition in some cases. Students enrolled at an in-state college can also take hybrid courses—classes that feature a mixture of online and on-campus requirements—and seamlessly complete required internships locally. UW’s School of Professional & Continuing Education offers online undergraduate and graduate degrees, certificates, and stand-alone courses for students who want to update their skills or complete prerequisites. Online undergrad students at UW can complete a bachelor of arts (BA) in early childhood & family studies or a BA in integrated social sciences. Both degrees are self-paced and can be earned within 2-4 years. Several online master’s degrees are also on offer, including a master of aerospace engineering, a master of library & information science, a master of sustainable transportation, and more. Most online programs at the school are designed so that students can attend class just one evening a week, and blended online/in-class programs are also available -- making UW one of the most flexible and convenient online colleges in Washington for distance learners. Online enrollment coaches are available to help students choose and apply for a program, and distance learners have access to IT resources, library services, and services offered through the Office of Minority of Affairs & Diversity. CityU is a private, non-profit university offering over 30 flexible online bachelor’s degree programs for working adults around the world. Degrees are available in areas such as teaching and education, business or project management, health & human services, computer & information systems, or professional leadership. In addition to fully online programs, students can choose to design a hybrid or “mixed mode” program through one of the best online colleges in Washington. CityU offers ongoing professional webinars to all students on topics like “The Power of the Infographic Resume” and “Networking to Build Business Contacts”. About three-quarters of CityU students attend part time while working full time. CityU serves an average of more than 6,000 students from 43 states and 27 countries. Headquartered in Seattle, CityU has satellite campuses in China, Mexico, Greece, and many other locations around the world, with a global alumni network of 50,000 and growing. Washington State is one of the best known and highest-ranking Washington online colleges. Founded as a public, nonprofit state university in 1891, WSU’s land-grant mission has propelled it to expand education to students within and beyond the local Pullman community. Students can choose from a range of Global Campus’ online bachelor’s degrees, including in the humanities, hospitality business management, psychology, and several others. WSU’s Global Connections initiative connects students through a variety of webinars, from Kettlebells 101 to advanced web search courses. Most major courses are offered in an accelerated seven-week format, while general education courses span the traditional 16-week semester. All programs are accredited by the Northwest Commission on Colleges and Universities, and many are also accredited by leading professional organizations in their respective field. WSU’s Digital Leadership Center also offers non-credit online learning opportunities, such as the 16-week leadership course, giving students the opportunity to earn valuable life skills and resumé-enhancing certification. CWU’s online campus “Finish Line” offers accredited online bachelor’s programs that have earned it a position as one of the top Washington online colleges. Programs are diverse, and include (but are not limited to) aviation management, IT and administrative management, and law and justice. Also available is a hybrid paramedicine undergraduate program, which is designed for certified paramedics and provides advanced study in the field. Several professional certificates and endorsements, such as project management and teacher certification, are also available. CWU is certified to offer degrees to students in most states, and non-resident online students pay the same tuition rates as in-state students. Canvas serves as the virtual classroom, and students have access to additional web tools like Blackboard Ultra for web conferencing and Turnitin for plagiarism detection. Other student resources include access to online research librarians and tutoring. CWU embraces an entrepreneurial spirit within its diverse student population, and more than 30% of students identify as minorities. Students can stay connected through various student-run media, including the Observer student newspaper, Pulse magazine, and The 'Burg radio station..
WWU’s “WesternOnline” is one of the top-ranked online colleges in Washington, offering online undergraduate degrees in human services or multidisciplinary studies, along with term- and self-paced independent learning courses. WWU’s distance learning programs are accredited by NWCCU and designed specifically for location-bound students, particularly those on the Kitsap and Olympic Peninsulas and other underserved locations. Online students enrolled in the multidisciplinary studies program work one-on-one with a personal advisor to design a program that meets a student’s interests and career objectives in fields like business, ecology, teaching, and more. State-based students who have prior college coursework or an associate degree are encouraged to apply to either program. Admissions are rolling, allowing students to begin their program at the start of any quarter throughout the year. WWU maintains partnerships with businesses and organizations throughout the state, providing connections to valuable internship opportunities. Online courses are accessed through the Canvas learning platform and students have access to all campus support and resources, including a counseling center and distance education librarian. EWU is a comprehensive public university located in Cheney with satellite campus locations throughout the state. The school is among the online colleges in Washington offering a wide range of undergraduate, graduate, certification, and continuing education programs that can be completed entirely online. EWU offers online bachelor’s degree completion programs at an accelerated pace. Options include programs in children’s studies, dental hygiene, interdisciplinary addiction studies, interdisciplinary health leadership, and a general interdisciplinary studies program. Online master’s programs include dental hygiene, public health, social work, and an education specialist in school psychology respecialization program. Students interested in pursuing a field of study beyond their desired major can choose from one of 13 minors offered online. Notably, non-admitted students have the opportunity to take courses for two quarters before being admitted as an EWU student. Distance students have access to eTutoring, among other resources, and can take part in an online student orientation before each new term. Since 1941, Renton Technical College's (RTC) has provided relevant, career-focused training to its students. RTC has expanded from its 30-acre campus in Renton, Washington, to include several satellite locations and online programs. With 12 programs and certificates available online, and a full bachelor's degree in application development, RTC is now one of the top online schools in Washington. RTC delivers its programs in both asynchronous and synchronous formats. Each study year is broken into quarters, which allows for multiple entry points in many of the programs. While admission requirements vary by program, most require students to have an overall GPA of 2.0 and program-specific prerequisites. Transfer credits are eligible and individually assessed by a credential evaluator. Once enrolled, online students receive access to the career center and various learning resources, such as tutoring and program planning assistance. Bellevue is a comprehensive, student-centered college focused on advancing the economic, social, and cultural life of its surrounding community. Students at Bellevue can earn a degree or certificate through a combination of online and in-class courses. Bachelor’s degrees on offer include interior design, digital marketing, molecular biosciences, and an RN to BSN program, among others. Online learners can complete courses in areas such as allied health education, business management, cultural & ethical studies, oceanography, radiation therapy, and more. Resources for online students include access to the library media center, an online advisor, and eTutoring. Several scholarship opportunities and workforce education programs are available through the school, making it one of the best colleges in Washington for students on a budget. Peninsula College is a community college located in Port Angeles, on the Olympic Peninsula of Washington. Part of the Washington Community and Technical Colleges System, the school offers a wide range of online associate degrees and one online bachelor’s degree program. Northwest offers six distinct bachelor of arts (BA) degree programs in business management, IT, organizational management, ministry leadership, psychology, or public safety administration. All NWCCU-accredited programs require completion of 120 general education and major credits. About 90% of full-time faculty have earned a PhD in their field of expertise, adding to its reputation as one of the top-ranking Washington online colleges. With a main campus in Kirkland and just a few minutes from Seattle, Northwest offers expert and community connections with some of the most innovative and forward-thinking arts and technology organizations in the country. Founded in 1934, Northwest is a private and nonprofit Christian university guided by three, representative values: Spiritual Vitality, Academic Excellence, and Empowered Engagement. Distance learners have access to many of the same resources as on-campus, including the library and career services. All classes are accessible 24/7 through Moodle. If you want to qualify for a range of high-paying job opportunities, earning a college degree is key. When deciding where and what you want to study, you may end up weighing both in-state and out-of-state schools. If you are from Washington, there are many advantages to attending college in your home state. Sticking close to home can qualify you for in-state tuition and help you build a network of regional professional contacts. You may also benefit from your school's name recognition on the local job market, and you'll be relatively close by if you need to occasionally visit campus. When researching programs, be sure to consider our list of the most affordable online colleges in Washington. All of the schools in this list are accredited, and our rankings highlight the colleges that offer the best blend of affordable tuition and return on investment. Established in 1861, the University of Washington operates campuses in Seattle, Bothell, and Tacoma. The highly regarded school also features a number of affordable online degrees and certificates. UW's flexible programs include fully online and hybrid degrees in areas such as integrated social sciences and early childhood and family studies. The school offers courses in both part-time and accelerated formats. Most programs take two years to complete, though some master's degrees can be completed in a year and most certificates in a few months. Additionally, UW offers a number of free courses through partnerships with online learning services like edX, Coursera, and Canvas Network. Established in 1966, Bellevue College represents one of the most affordable online colleges in Washington. The school offers several online certificates and degrees at the bachelor's and associate levels in disciplines such as healthcare informatics and healthcare management. Students take both fully online and hybrid courses through Canvas. New students can take a free four-day workshop to familiarize themselves with the online learning platform. Additionally, BC offers a free online tutoring service to all students through eTutoring. Distance learners in Kentucky, Delaware, and Puerto Rico are not eligible to take BC's online courses. Established in 1893 in Bellingham, Western Washington University, one of the most affordable online colleges in Washington, stands out for its green campus and innovative curricula. The school offers a number of programs online, including an online bachelor's in human services, a TESOL certificate/endorsement, and a partially online multidisciplinary bachelor's degree available to students residing within the Kitsap and Olympic peninsulas. WWU allows students to choose between synchronous, term-based online courses or asynchronous, self-paced online courses. Students complete most online coursework through the Canvas learning platform, though certain courses incorporate other platforms. Established in 1890 in Pullman, Washington State University continues to distinguish itself as a home for nationally recognized research opportunities and instruction with an affordable price tag. WSU, premiere among affordable online colleges in Washington, offers a wide range of degrees, certificates, and endorsements in both fully online and hybrid formats. Students complete most online coursework through Blackboard in courses that combine synchronous and asynchronous learning. Most online degrees require around 30 credits to complete at either a part-time or accelerated two-year pace. The school offers all students free access to its online tutoring and writing service. A GPA of 3.5 or higher is competitive for admission to WSU. Since 1973, City University of Seattle delivers high-quality instruction geared towards working professionals. As one of the most affordable online colleges in Washington, CUS offers a wide range of fully online and hybrid degrees. Students complete online coursework through Blackboard in classes that combine synchronous and asynchronous learning. Students may complete online degrees at either a part-time or accelerated pace and can transfer up to 135 credits. Additionally, courses that use performance-based assessment make it easier for working professionals to graduate quickly. Students can obtain many of the bachelor's degrees within a year. Since 1961, Peninsula College, established in beautiful Port Angeles, offers online associate degrees in areas such as business administration, criminal justice, and information technology. An online bachelor's degree in management is also available along with certificates in sustainable agriculture and entrepreneurship. Students take both fully online and hybrid courses through Canvas. New students can take Canvas Quickstart, a free, self-paced course that familiarizes students with the online learning platform. Students must maintain a GPA of 2.0 or higher to remain eligible for financial aid. Established in 1891, Central Washington University continues to distinguish itself as one of the fastest-growing colleges in Washington. CUS offers a wide range of fully online degrees along with three hybridized degrees that require on-campus work. Students can earn bachelor's and master's degrees in fields such as information technology, public health, and creative writing, all of which make CUS a well respected school among affordable online colleges in Washington. Students complete most online coursework through Blackboard in courses that combine synchronous and asynchronous learning. Distance learners in Alabama, Arkansas, Iowa, Kansas, Maryland, Minnesota, and Missouri are not eligible to enroll in CWU's online courses. Established in 1882 in Cheney, Eastern Washington University stands out among colleges in Washington for its pragmatic, community-focused approach. This highly affordable public university offers a number of fully online and hybrid degrees in areas such as children's studies, dental hygiene, and addiction studies. Courses come in both self-paced and accelerated formats, and students complete either online or hybrid courses through the Canvas learning platform. New students can participate in a live orientation on navigating Canvas held before each term. EWU offers a free online tutoring service to all students through the eTutoring platform. The school also allows non-admitted students to take courses for up to two quarters prior to admission. Heritage University, established in 1907 in Toppenish, offers several degrees in fully online and hybrid formats. At the undergraduate level, students can obtain degrees in English and the humanities. At the graduate level, degrees are available in English, educational administration, and in a special category known as Proteach Portfolio, tailored for residency-certified Washington teachers needing second-level certification. Coursework at HU is strongly slanted towards multiculturalism and includes innovative majors in American Indian studies. Courses come in both self-paced and accelerated formats. HU provides all students access to free online tutoring services through Smarthinking. Established in 1934 in Kirkland, Northwest University provides a well-rounded liberal arts education with a Christian foundation. The school, a standout among affordable colleges in Washington, offers a number of degrees and certificates in both fully online and hybrid formats. Undergraduate degrees are available in areas such as information technology, business management, and psychology. Undergraduate applicants must have achieved a GPA of 2.3 for consideration for regular admission. Active duty service members and veterans are eligible for financial aid packages that may not need to be repaid. Distance learners in Connecticut, Florida, Kentucky, Massachusetts, Wisconsin, and Washington, D.C., are not eligible to take NU's online courses. Online education is becoming more and more popular in Washington; in 2012, a total of 27,848 students attended online higher education programs exclusively. Of these distance learners, 8,851 were enrolled in public, 4-year institutions. Distance learning make it possible for students to completely remove their commutes, create their own flexible schedules and access high quality courses increasingly similar to those offered on-campus—it's no wonder busy people eager to advance their careers are choosing it over traditional college. Washington is home to a thriving economy that boasts the second-highest minimum wage in the nation. However, cost of living in the state has risen dramatically in the last decade, and along with it, so has college tuition. But tuition rates and financial aid are in transition; the Washington state Senate recently passed a bill that will reduce public university tuition up to 20% over the next five years, and all of these institutions offer partially or entirely online degree programs. Additionally, Washington granted $363.5 million in state-based financial aid in the academic year of 2012-2013. Also of note is the state's first nonprofit, 100% online university, WGU Washington, which has become a model for best practices in web-based learning. Students seeking high quality, innovative online programs would do well to research those offered in the state of Washington. 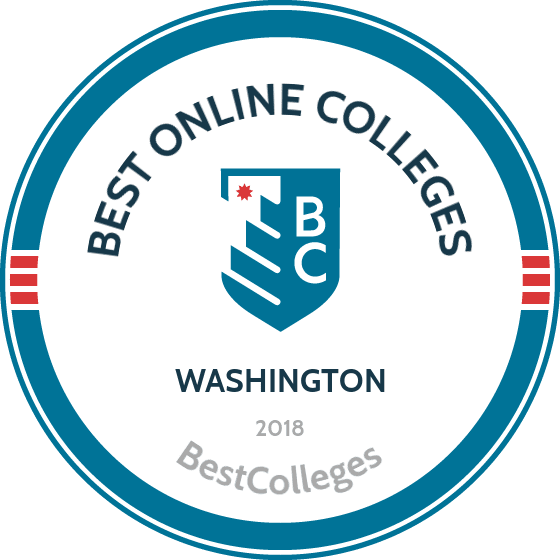 Browse our list of the best online colleges in Washington for more insight into distance learning programs in this state. A recent NCES report shows that 7.5% of students in Washington (for a total of 27,848) enrolled in exclusively online degree programs. Washington recently joined the State Authorization Reciprocity Agreement, or SARA, which promotes distance learning across state borders by unifying standards for degree programs, keeping tuition increases in check, and providing a safeguard against fraudulent or sub-par programs. Additionally, online learners have access to WashingtonOnline, which provides students (and teachers) with support and resources, such as a schedule organizer and bookstore, as well as information on all the online programs in the state. Employment growth in this profession is strong in Washington. According to the Washington Employment Security Department, long term projections show an increase of 57% in the total number of jobs between 2014 and 2024. Wages decreased by 5% from 2011-2016. In 2016, what were the top careers in Washington for people who had a degree in business administration and management? Data source: Washington Employment Security Department, Bureau of Labor Statistics. Data may not be available for every year. Employment growth in this profession is strong in Washington. According to the Washington Employment Security Department, long term projections show an increase of 25% in the total number of jobs between 2014 and 2024. Wages increased by 4% from 2011-2016. In 2016, what were the top careers in Washington for people who had a degree in social sciences? Employment growth in this profession is strong in Washington. According to the Washington Employment Security Department, long term projections show an increase of 330% in the total number of jobs between 2014 and 2024. Wages increased by 17% from 2011-2016. In 2016, what were the top careers in Washington for people who had a degree in criminal justice/law enforcement administration? In 2016, what were the top careers in Washington for people who had a degree in psychology? Employment growth in this profession is strong in Washington. According to the Washington Employment Security Department, long term projections show an increase of 25% in the total number of jobs between 2014 and 2024. Wages increased by 30% from 2011-2016. In 2016, what were the top careers in Washington for people who had a degree in human services?